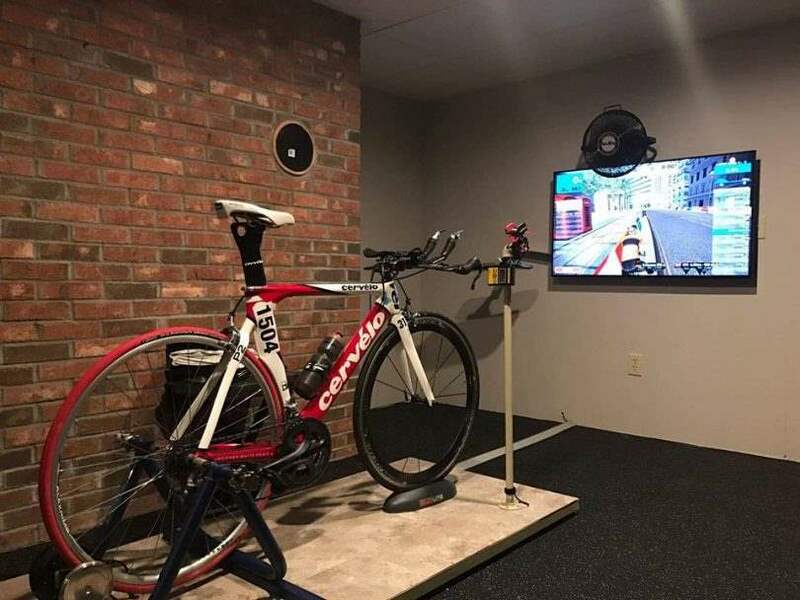 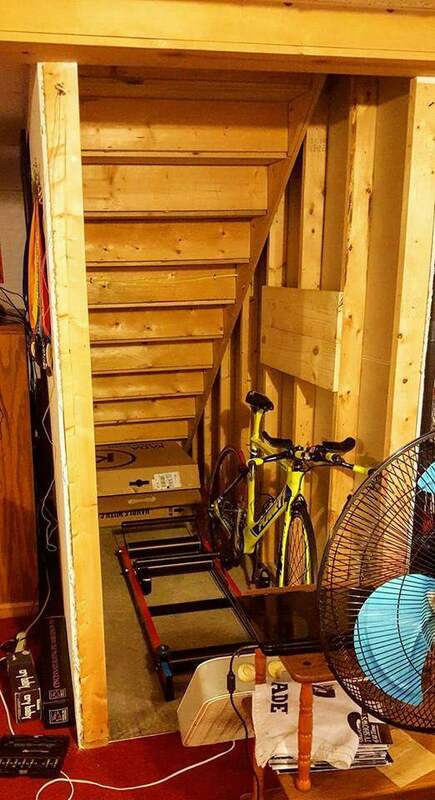 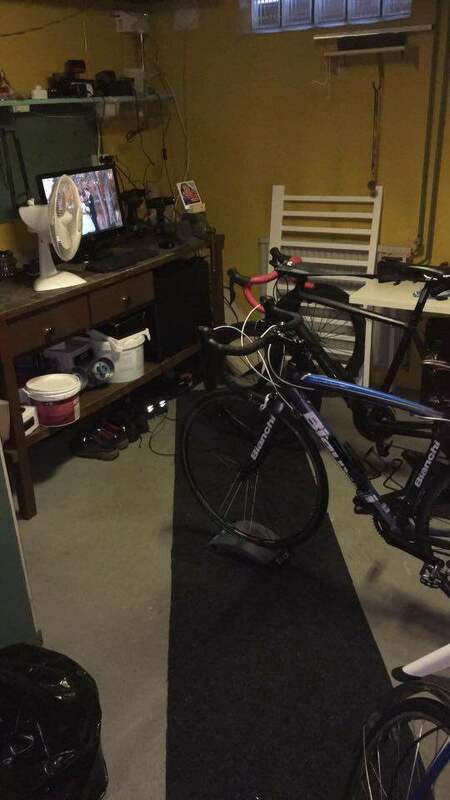 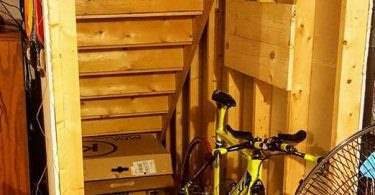 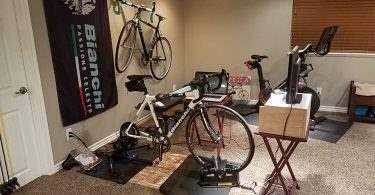 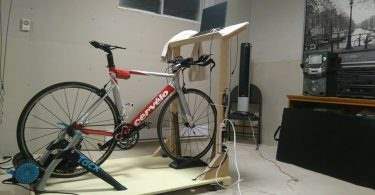 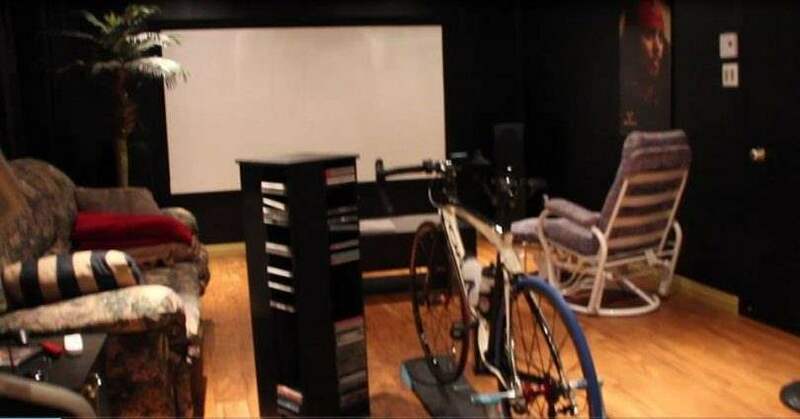 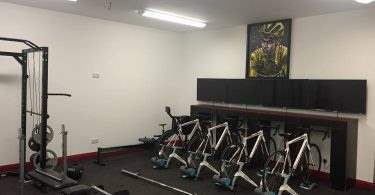 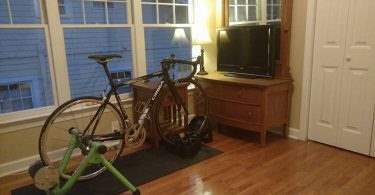 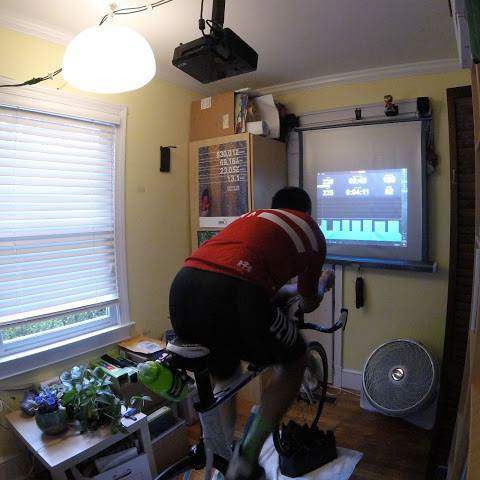 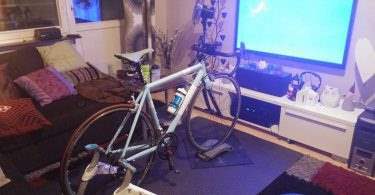 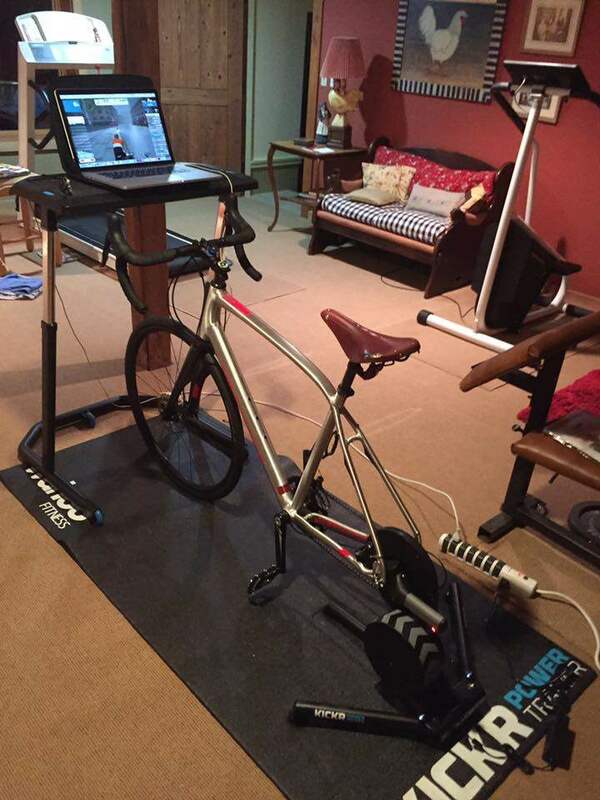 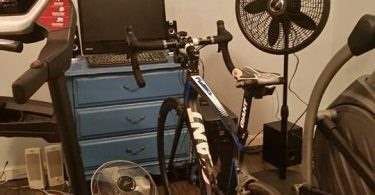 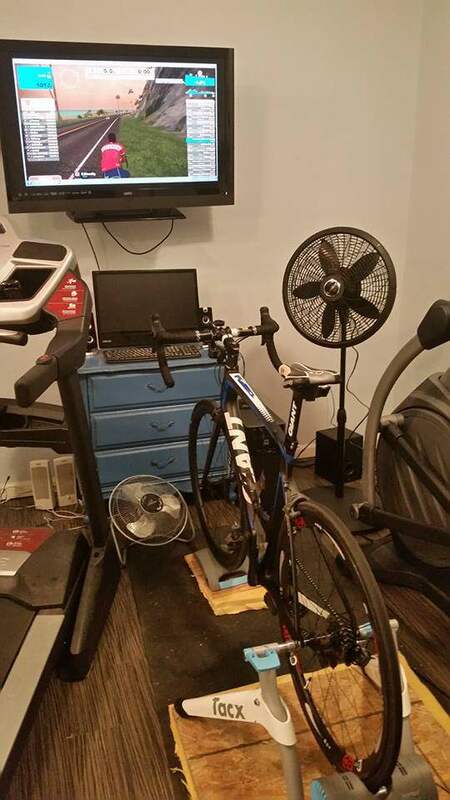 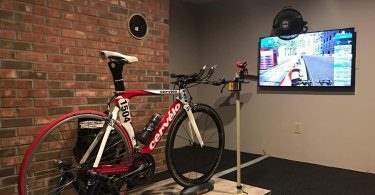 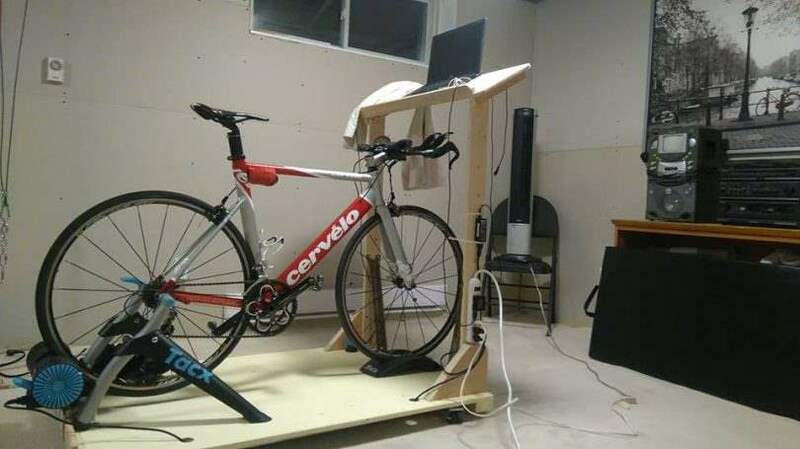 Cyclists and triathletes have an intimate relationship with their pain cave. 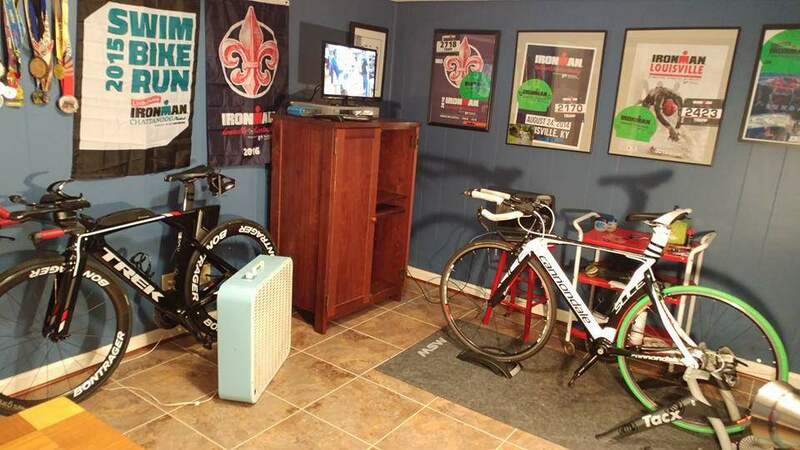 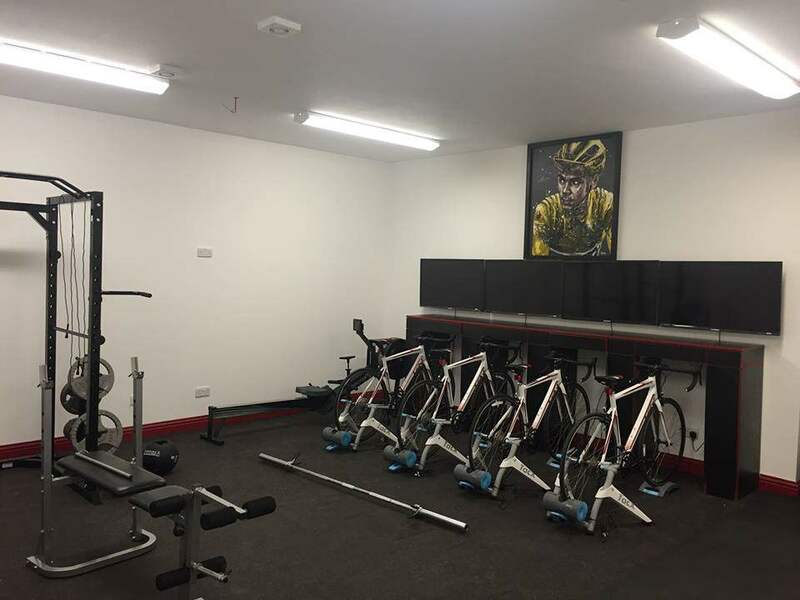 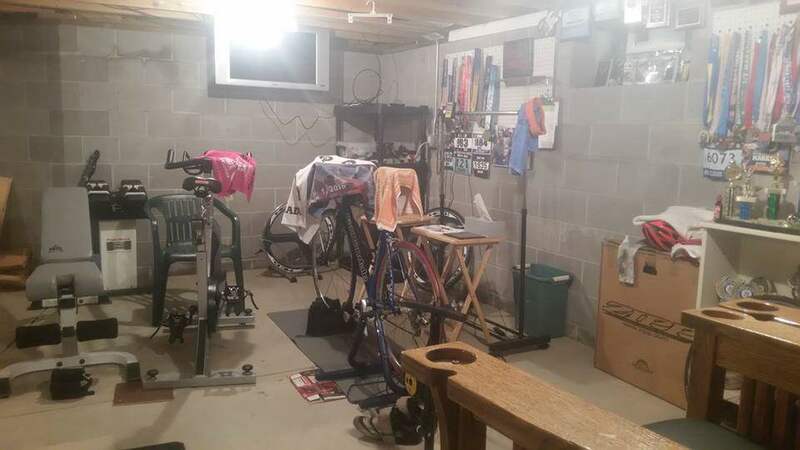 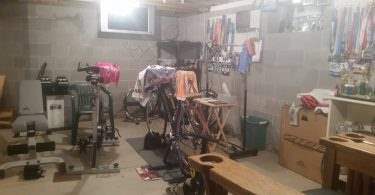 The pain cave aka home gym is where athletes spend most of their time trying to get stronger and better. 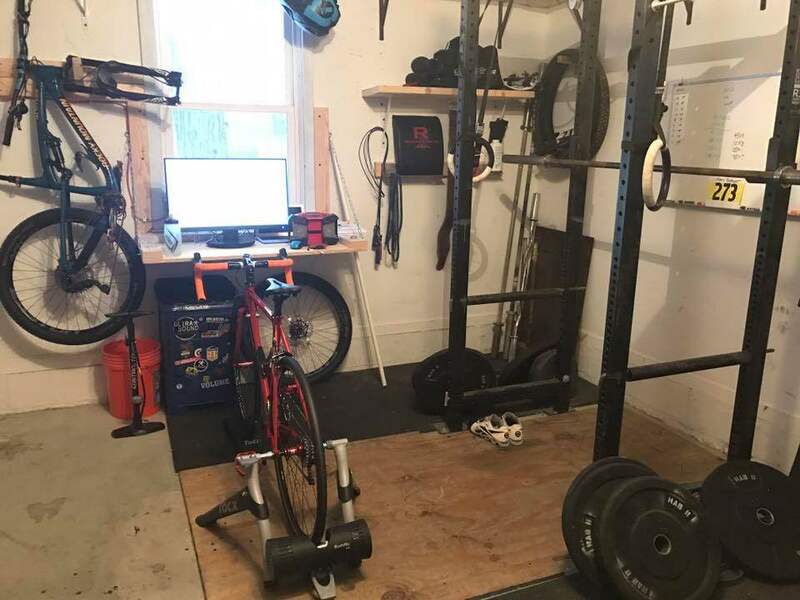 To celebrate the launch of this site, I created our first giveaway. 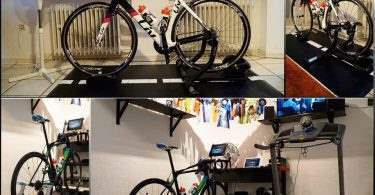 I wanted to see these photos. Many graciously shared their photos on our Facebook page, and many helped spread the word about SmartBikeTrainers. 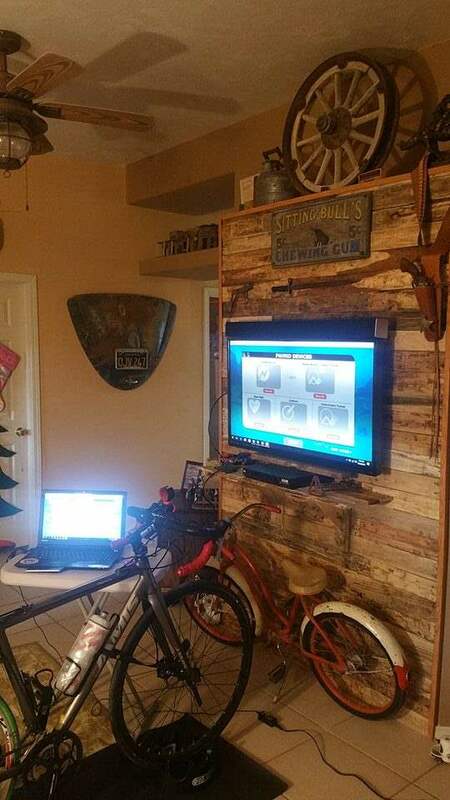 We also awarded a random winner with a $100 gift card. 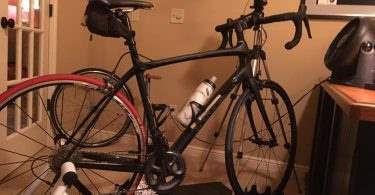 I’ve been riding since I was a kid, but I really started into triathlon about ten years ago. 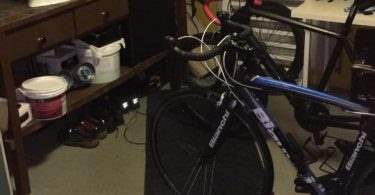 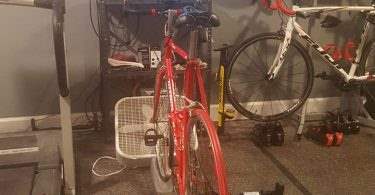 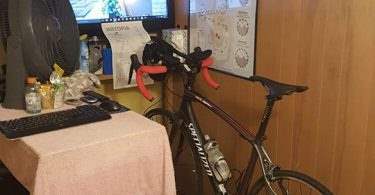 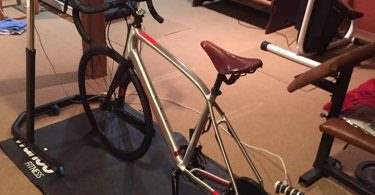 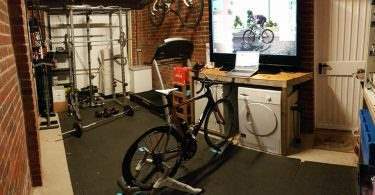 For nine years, I used the same $150 Performance Bicycle trainer for all my riding, including three Ironmans. 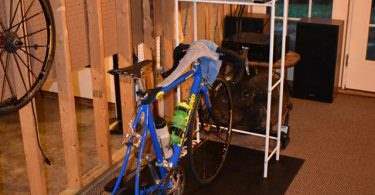 It was so worn out, I did intervals in the biggest gear without topping out. 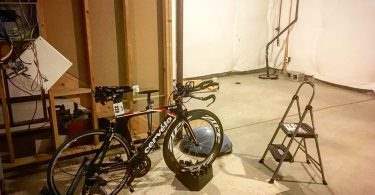 So, when my wife and I decided to build our home this year, my only goal was to get out of the frozen/hot/dusty garage riding situation. 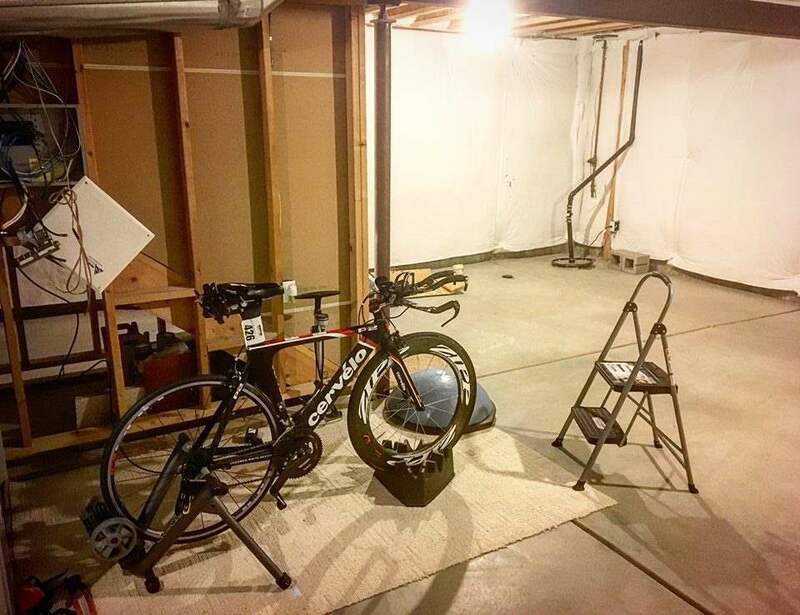 My pain cave was designed from the ground up. 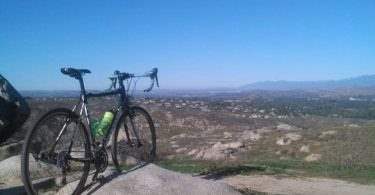 First the environs. 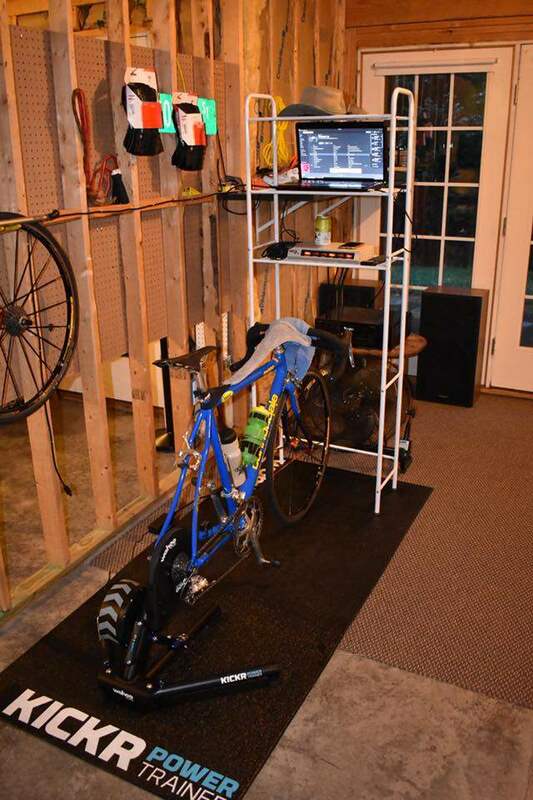 We went with a polished concrete floor so we wouldn’t have to worry about sweat dripping on the floor. 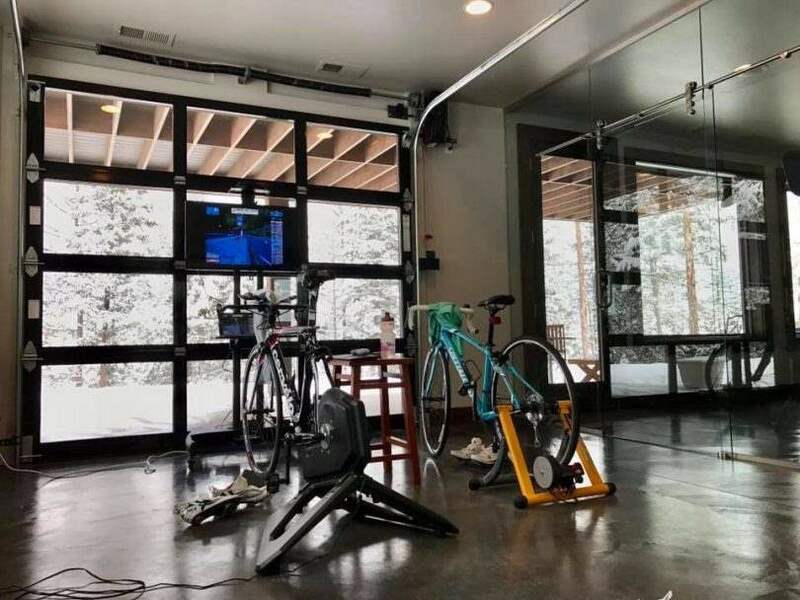 As I ride indoors 95% of the time (I’ve been almost killed numerous times by the terrible drivers here in Montana….we have the highest highway fatality rate in all the US), I wanted a place that I could open up to the fresh air in the summer and feel the breeze. 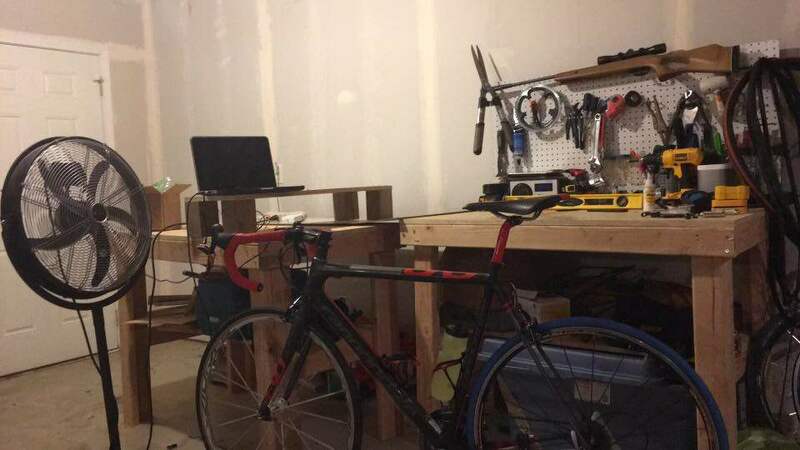 So we installed a garage door on the front. 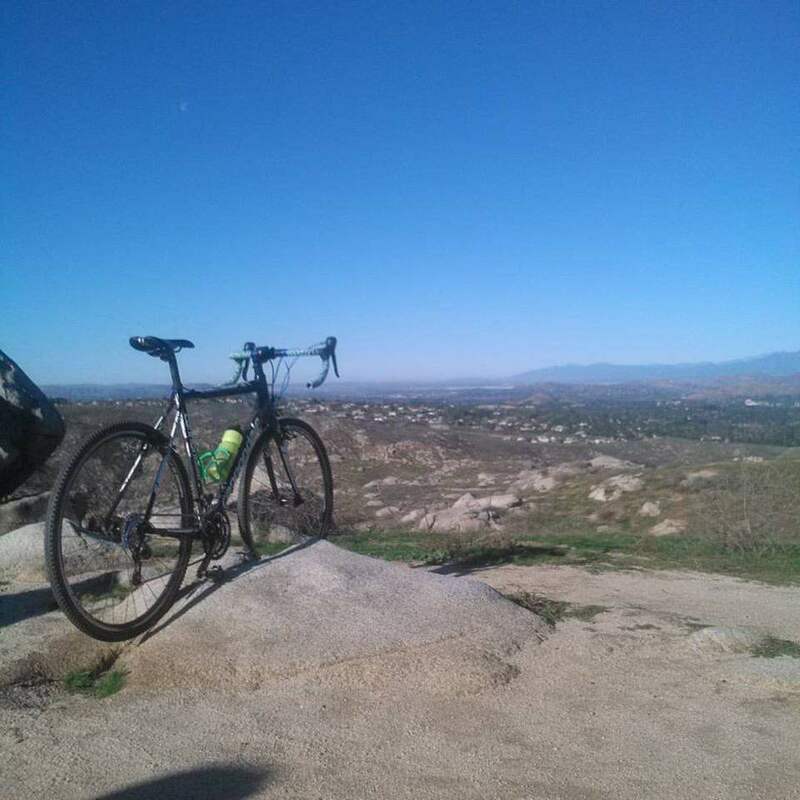 To capitalize on the view, we made it almost entirely out of glass. 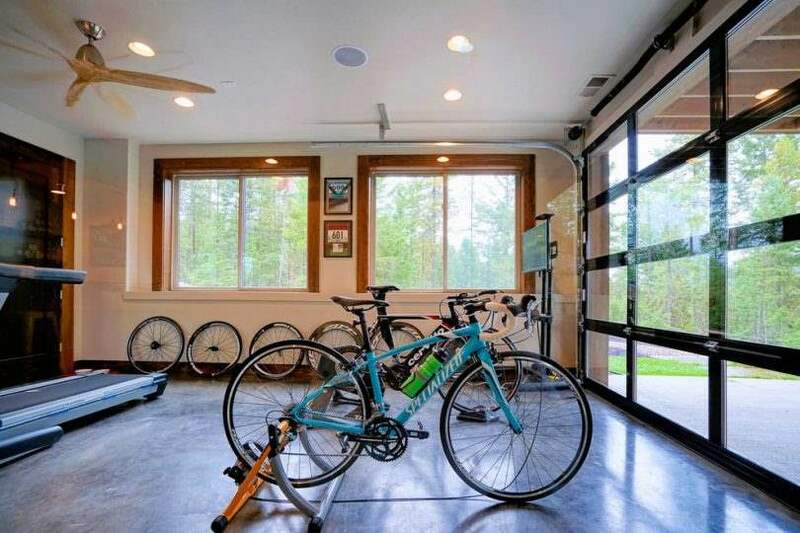 Outside of the garage door, there is a large concrete patio and a grassy flat area for yoga or lifting. 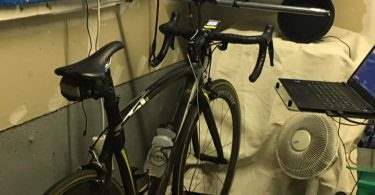 Equipment wise, my bike is a trust Cervelo P2, 2012 edition. 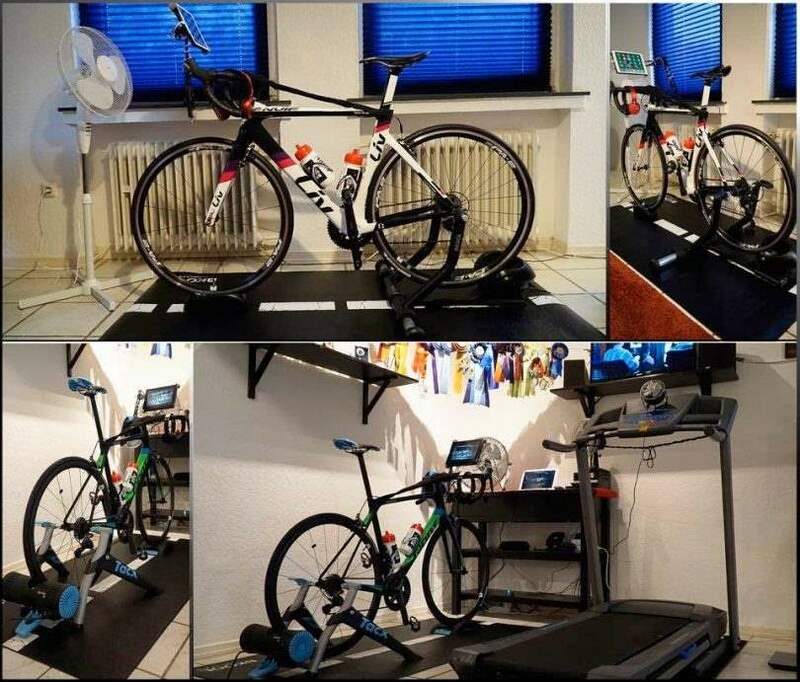 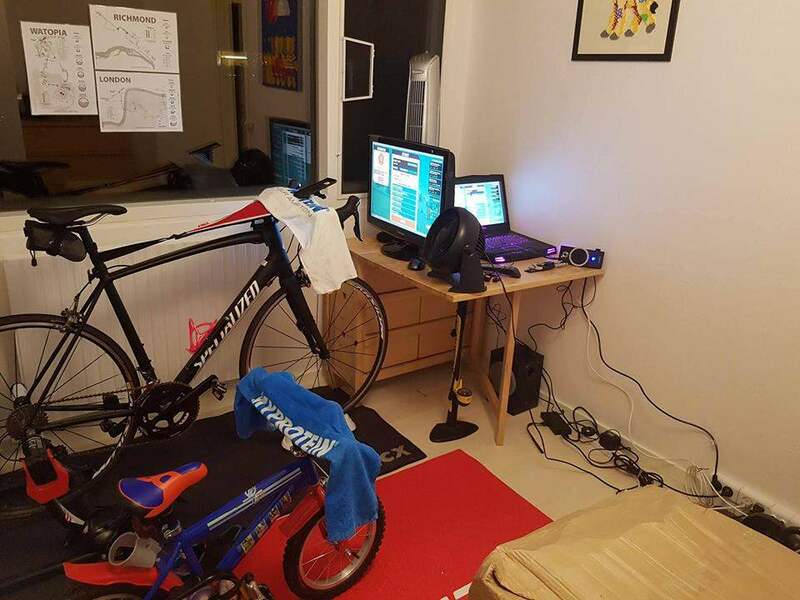 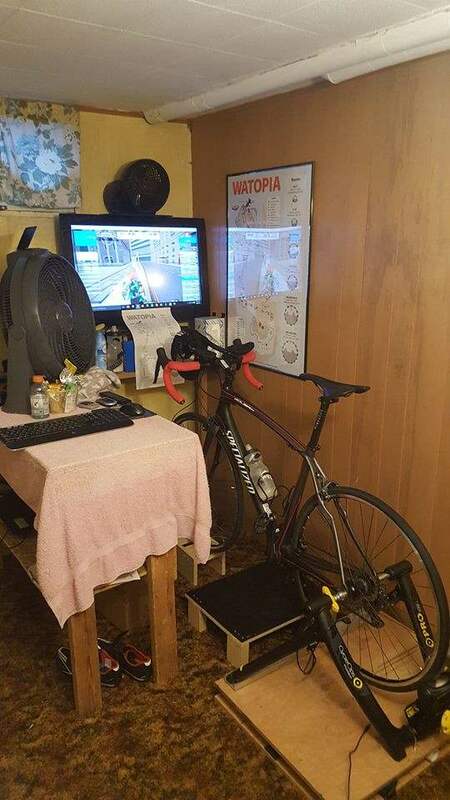 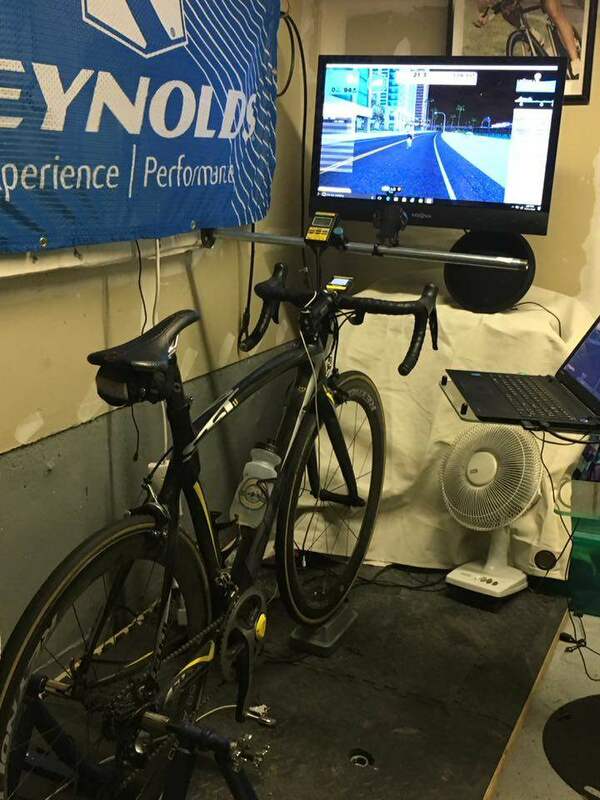 I chucked the $150 trainer and treated myself to a Tacx Neo. 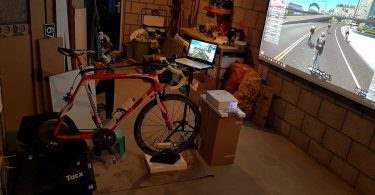 I also have a Quarq Powermeter crank for racing measurements. 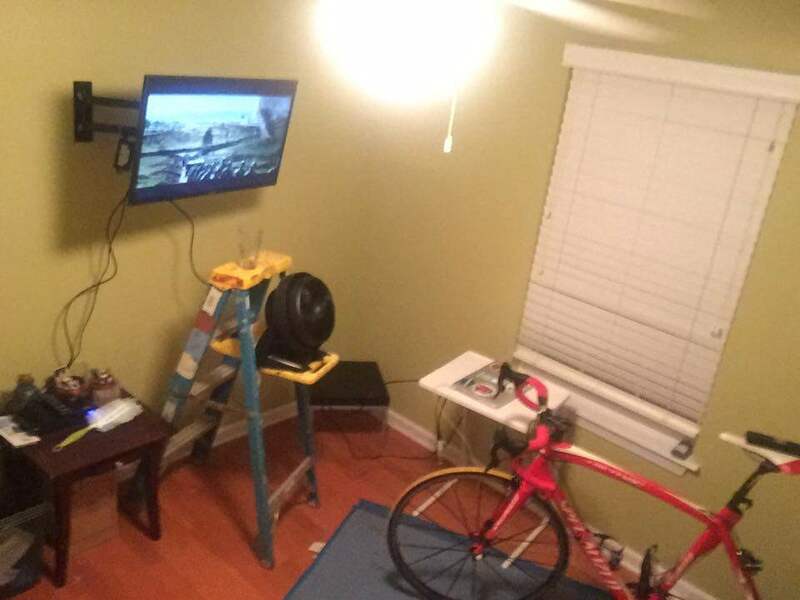 There are multiple connection possibilities in my set up. 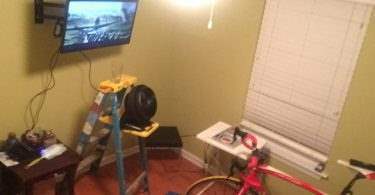 I have a 45-inch flat screen Vizio LCD mounted to a rolling TV stand. 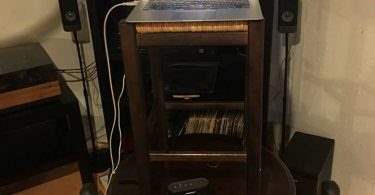 The stand also has a table attached to put peripherals. 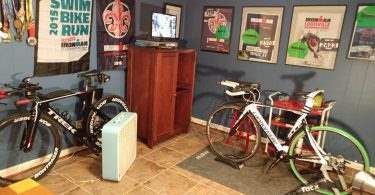 As you can see from the pic, my wife and kids sometimes ride along side with me on a used mag trainer. 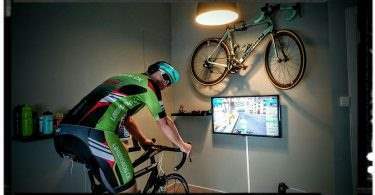 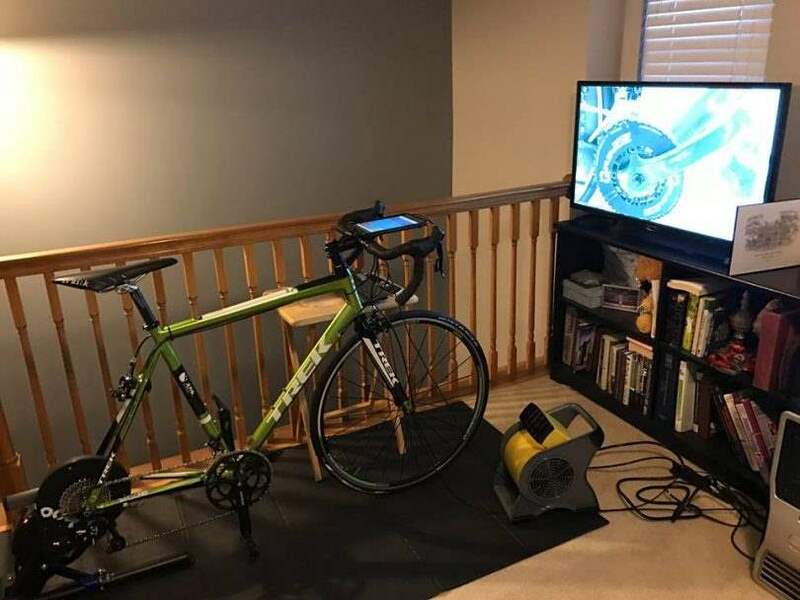 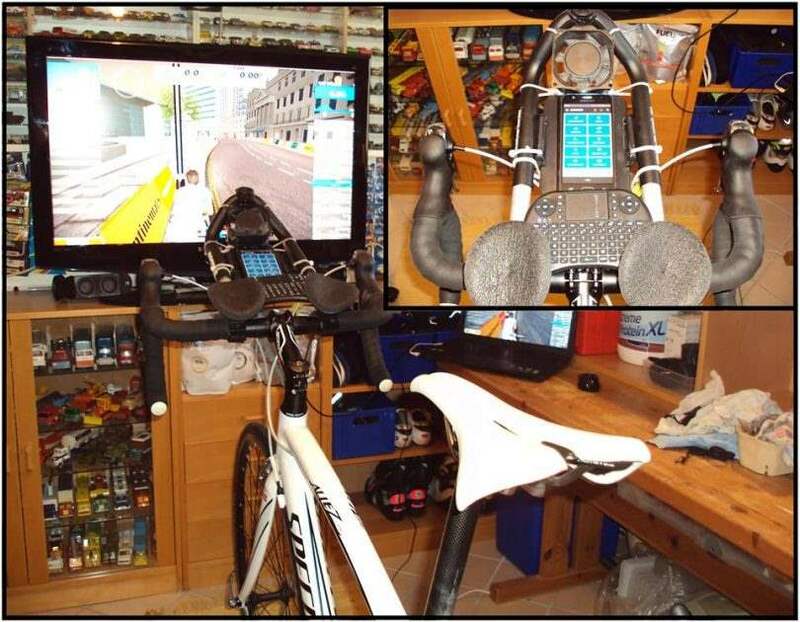 In that case, I turn on Direct TV on the flat screen and use a laptop/iPad on the stand for either Zwift or Trainerroad. 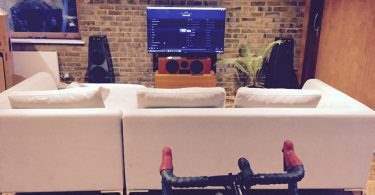 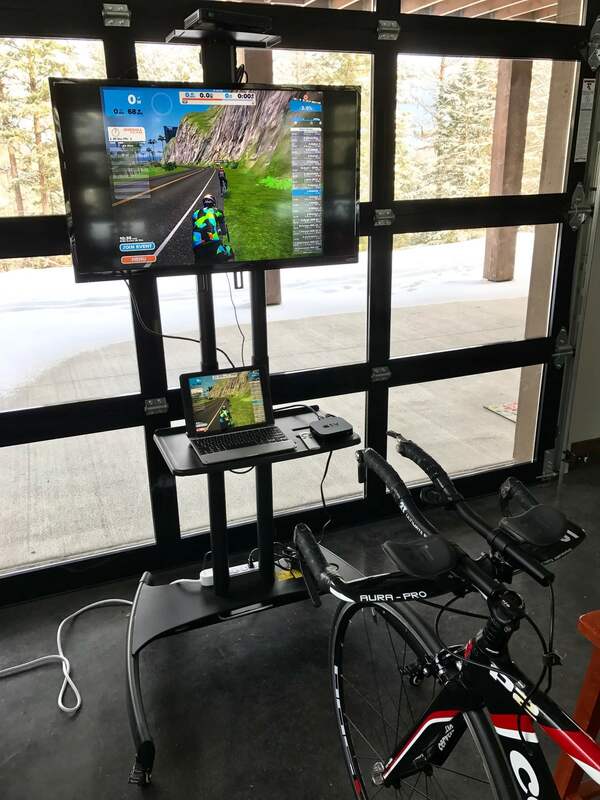 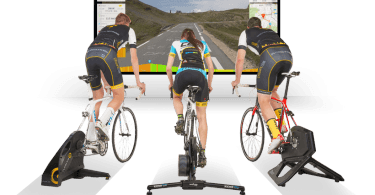 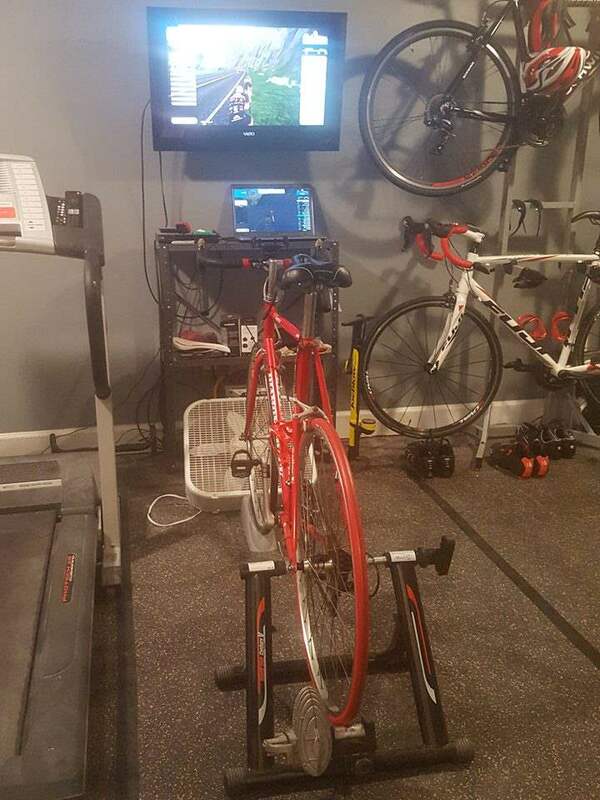 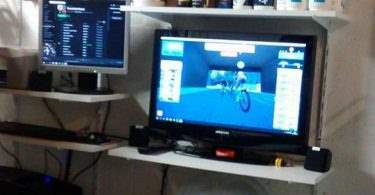 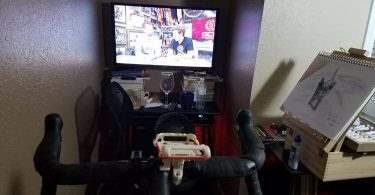 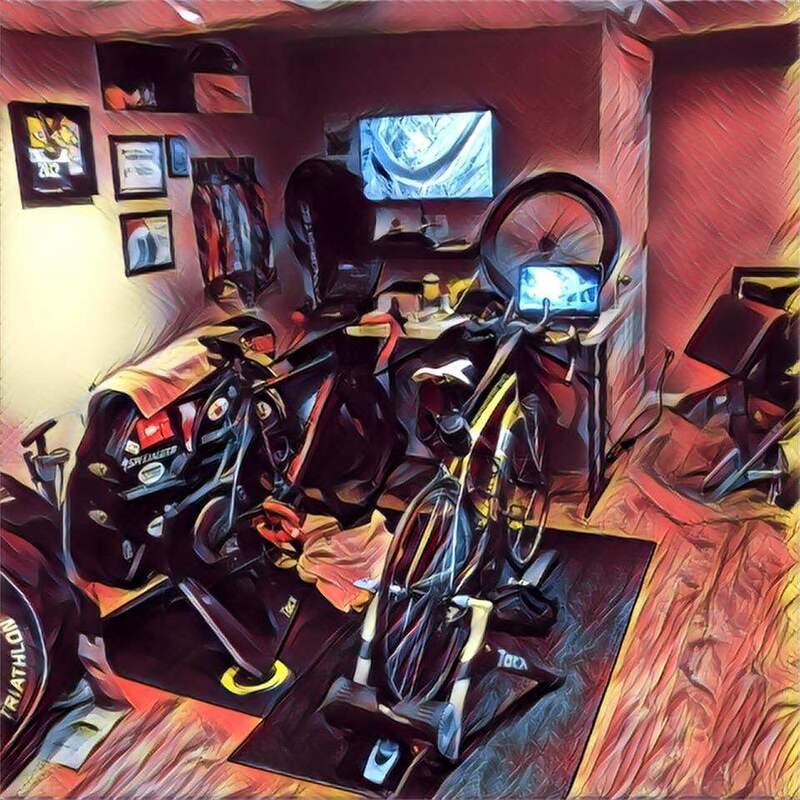 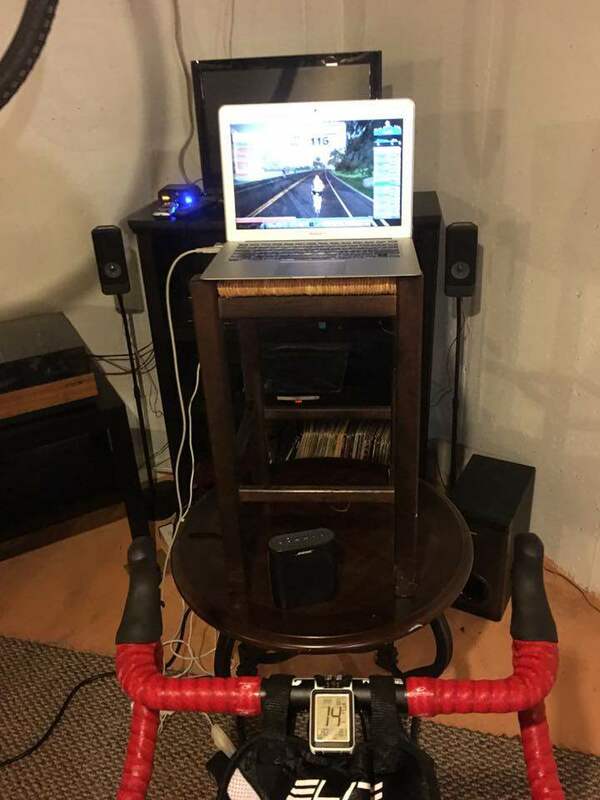 If I am alone, I will usually run Zwift on my iPad Pro 9.7, and use an Apple TV connection to display it on the big screen LCD. 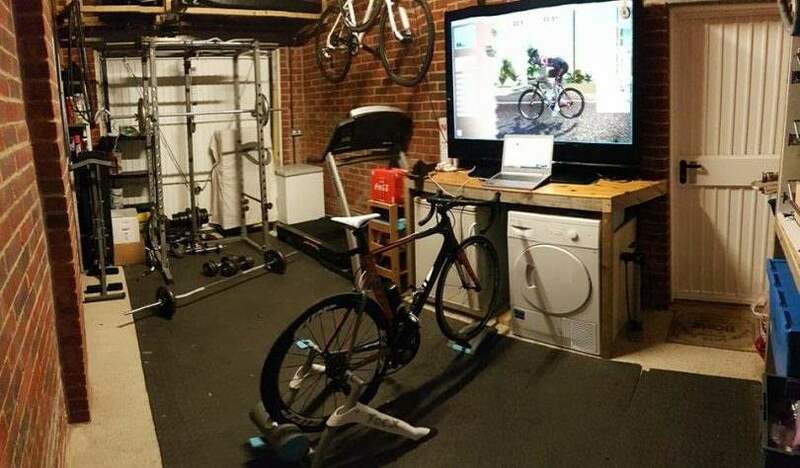 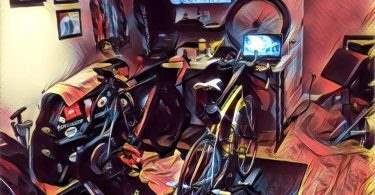 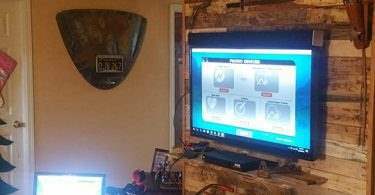 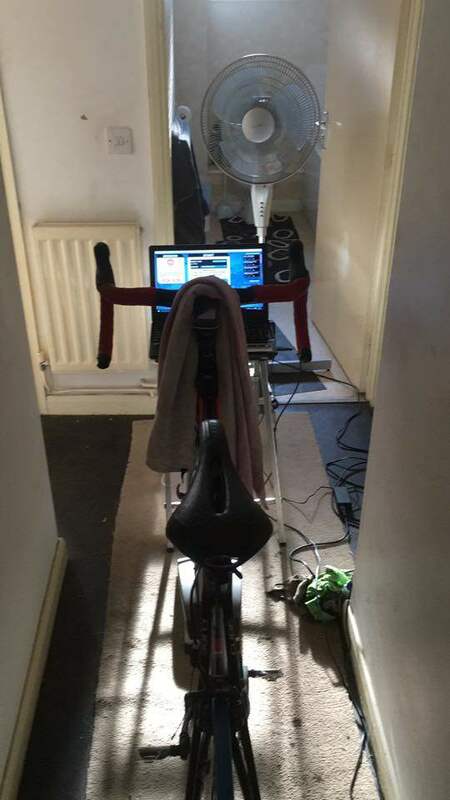 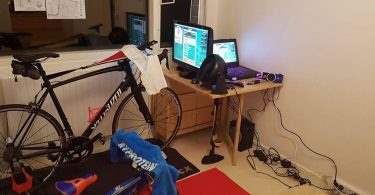 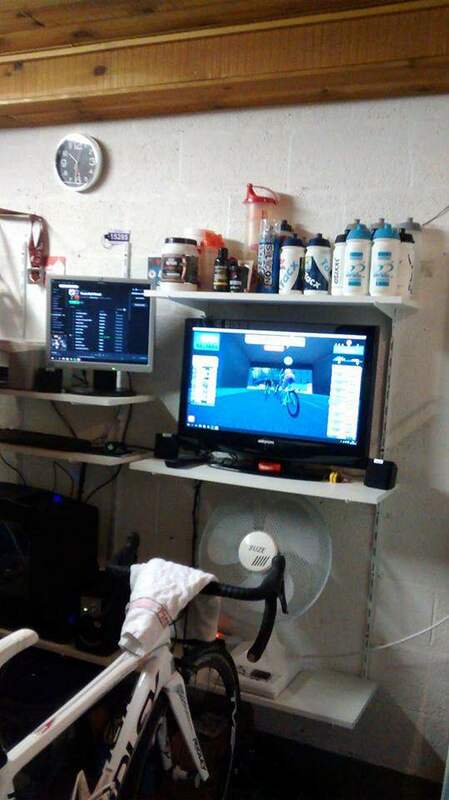 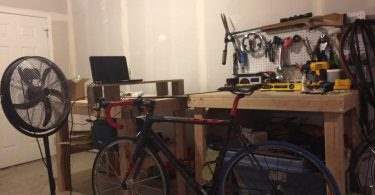 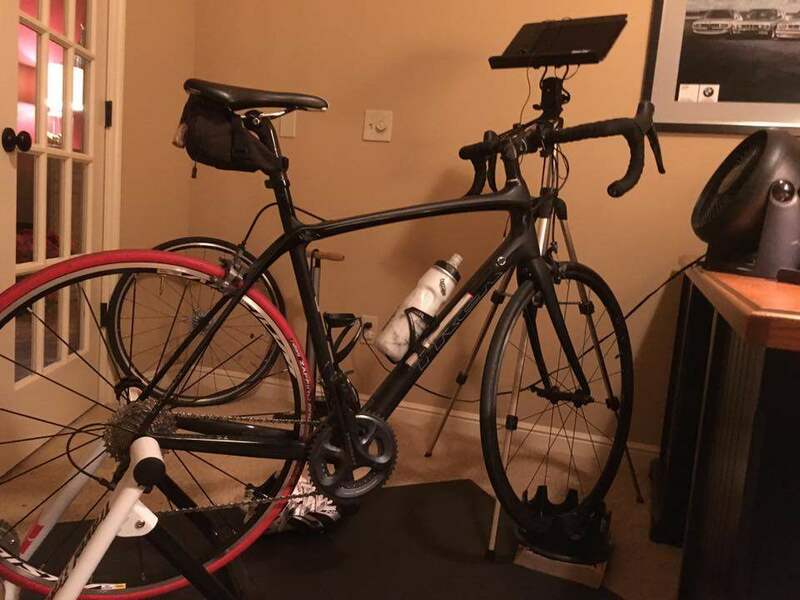 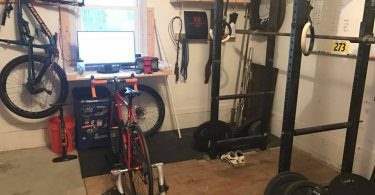 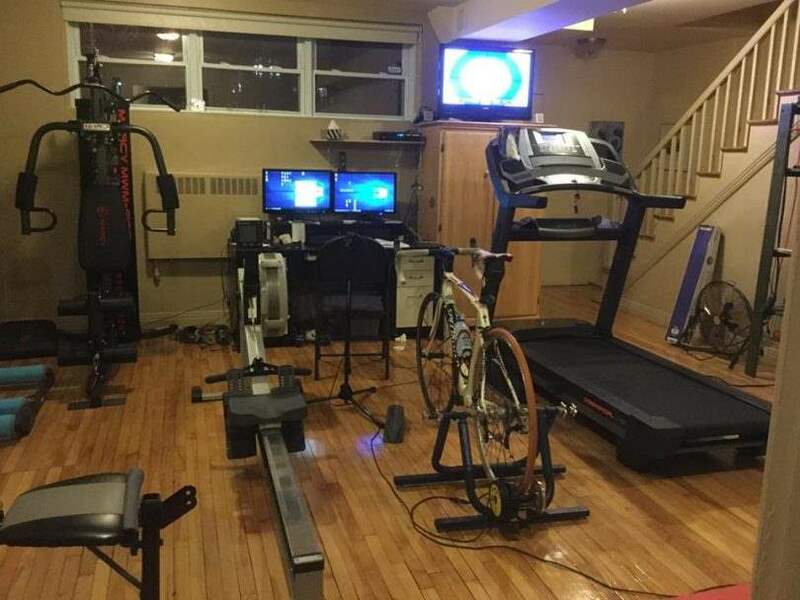 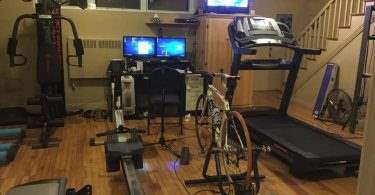 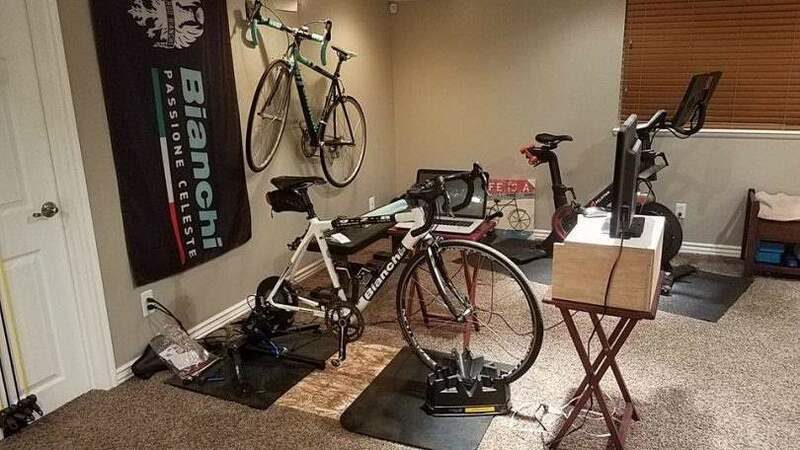 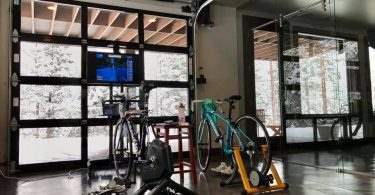 If I want to do a Trainerroad workout, I also will run that on a separate laptop just for wattage guidance; I don’ feel the need to record every single workout I’ve done anymore. 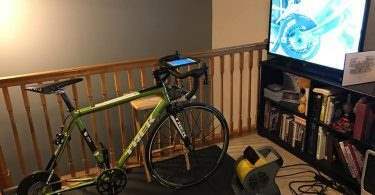 When it is time to run, I roll the TV stand to the back of the cave in front of my Nordic Trac treadmill. 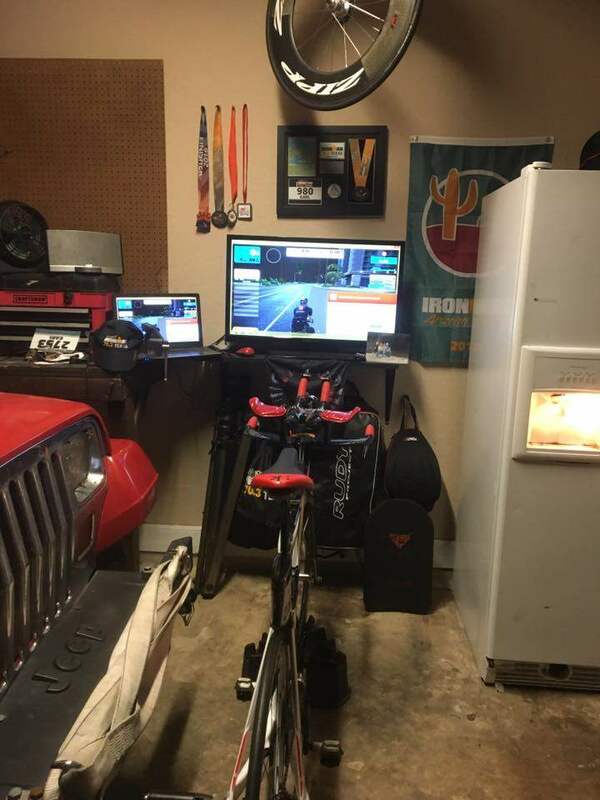 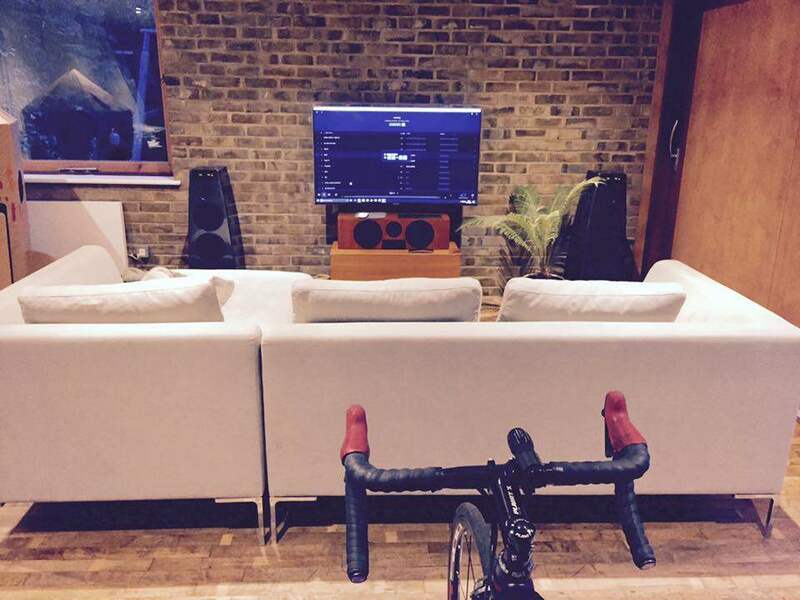 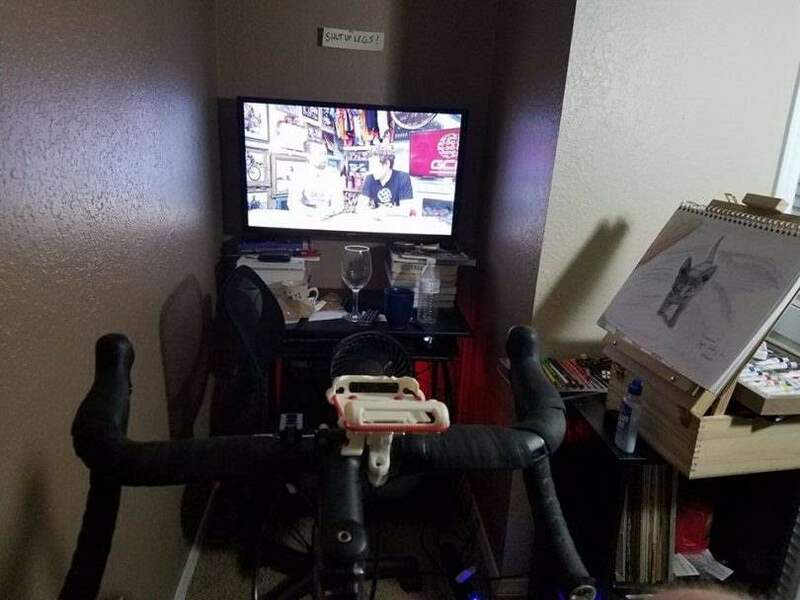 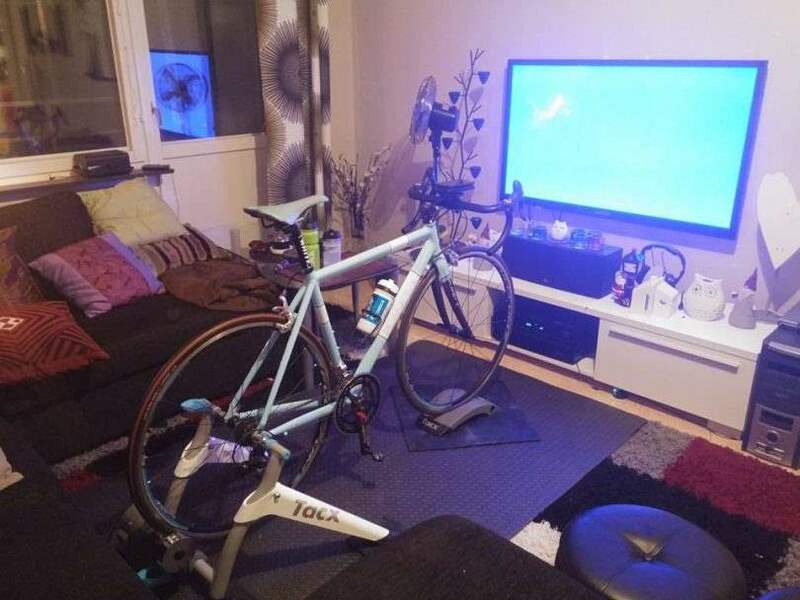 Lately, I will run on Zwift via the Ipad and watch TV in the background. 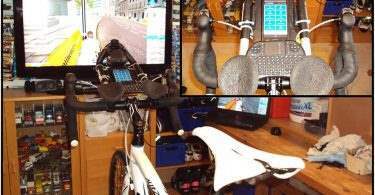 My running setup consists of a Garmin Foot Pod and the 4iiii heart rate monitor to convert ANT to Bluetooth. Most importantly, the glass wall is both for aesthetics and function. 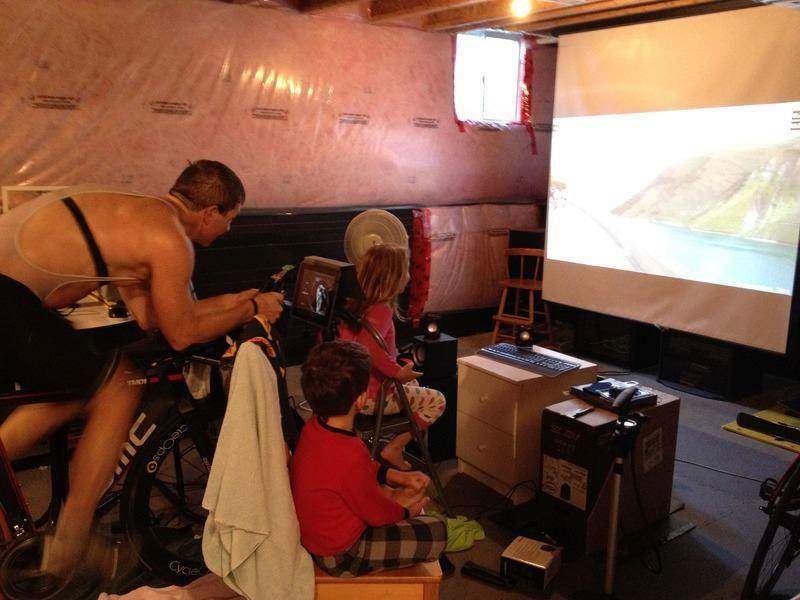 We look out on the Rocky Mountains, so we didn’t want to close off the view from the rest of the walk out basement. 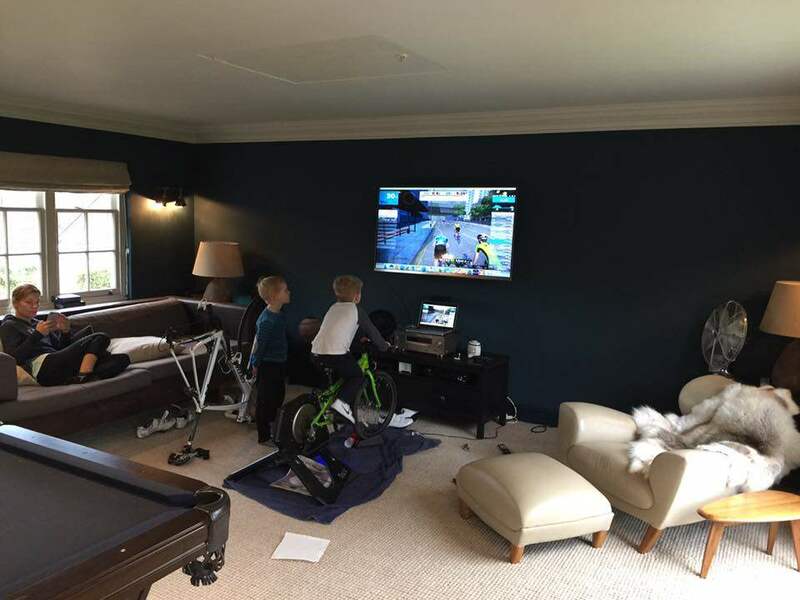 Second, we have our Playstation and big projector screen just opposite the glass wall on the other side. 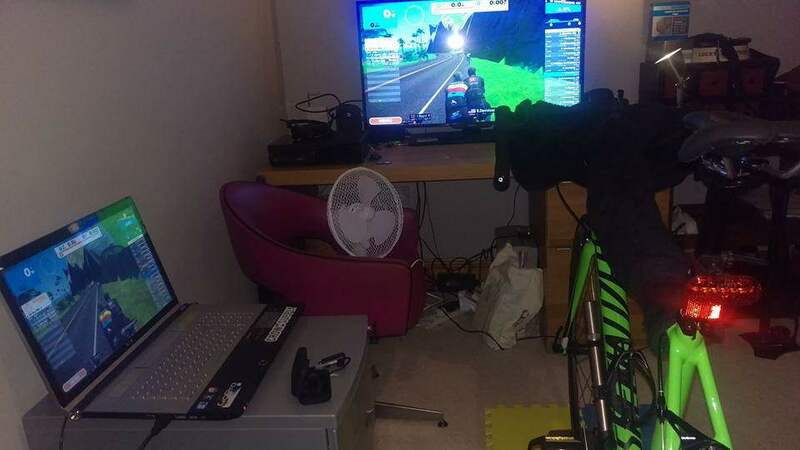 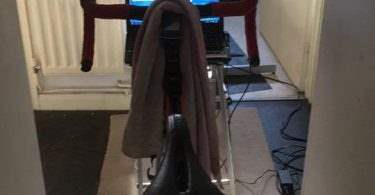 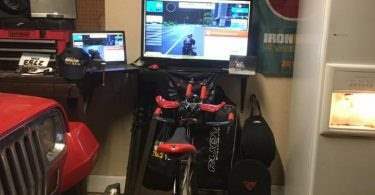 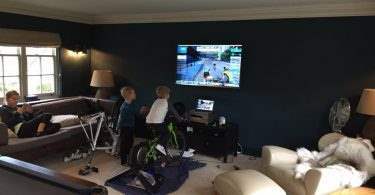 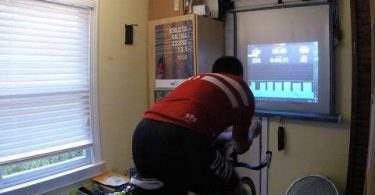 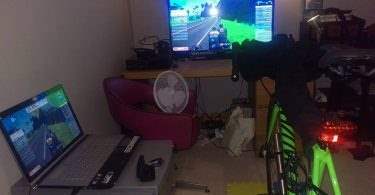 I have four little kids, and if I am on a long ride, I can keep an eye on them while they play some video games without having them be bothered by the sound of me working out. 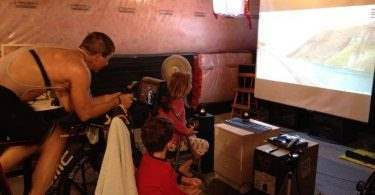 Finally, I uploaded most of the photos we received here for your viewing. 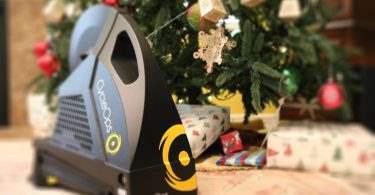 Enjoy and happy holidays!